How to change your Volvo wiper blades. This tutorial works on most late model Volvo's. This is an attempt to help out Volvo owners but we are not professional technicians so if you aren't sure you replaced the wipers correctly consult your local Volvo dealership. 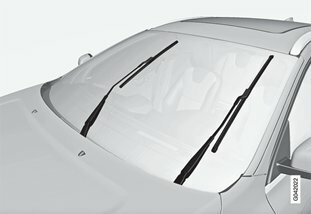 The wiper blades sweep water away from the windscreen and rear window. Together with the washer fluid they clean the windows and ensure visibility for driving. 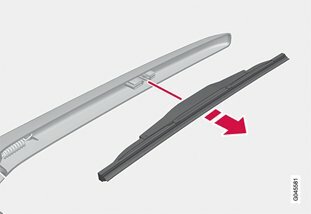 The windscreen wiper blades must be in service position when they are to be replaced. In order to change, clean or lift the wiper blades (for scraping off ice from the windscreen, for example) they must be in service position. Before placing the wiper blades in the service position, make sure that they are not frozen down. Insert the remote control key in the ignition switch and briefly press theSTART/STOP ENGINE button to set the car's electrical system to key position I. For detailed information on key positions, see Key positions - functions at different levels. Briefly press the START/STOP ENGINE button again to set the car’s electrical system in key position 0. 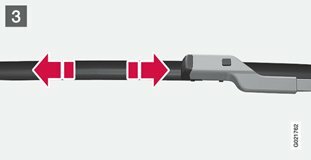 Within 3 seconds, move the right stalk switch up and hold it in position forapprox. 1 second. The wipers then move to standing straight up. The wipers return to their starting position when you briefly press the START/STOP ENGINE button to set the car’s electrical system to key position I (or when the car is started). 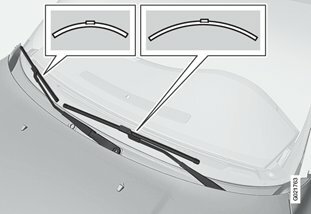 If the wiper arms in the service position have been folded up from the windscreen, they must be folded back down onto the windscreen before the wipers are allowed to return to their starting position. This is to avoid scraping the paint on the bonnet. 1. Fold up the wiper arm when it is in service position. 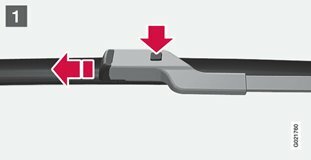 Press the button located on the wiper blade mounting and pull straight out parallel with the wiper arm. 3. Check that the blade is firmly installed. 4. Fold the wiper arm back towards the windscreen. The wipers return from service position to their starting position when you briefly press the START/STOP ENGINE button to set the car’s electrical system to key position I (or when the car is started). The wiper blades are different lengths. The blade on the driver's side is longer than on the passenger side. Since the car is equipped with airbag Pedestrian Airbag, Volvo recommends that genuine wiper arms are used and that you only use genuine parts for them. 2. Grip the inner section of the blade (by the arrow). Check the blades regularly. 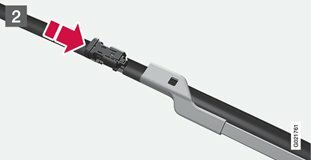 Neglected maintenance shortens the service life of the wiper blades.